Forests and Environ-ment Minister Dr Hasan Mahmud Friday said Bashundhara Group is working hard to change the scenario of the country by bringing a rapid and revolutionary change in the real-estate sector. “With its remarkable contribution to the national economy, Bashundhara Group has become a leading business conglomerate in the country over time,” he added. The minister said this at a prize-giving ceremony of Bashundhara Group Cup Golf Tournament-2013 held at Savar Golf Club. Speaking at the programme as chief guest, he further said that private entrepreneurs over the last thirty years are contributing to the housing market where Bashundhara Group is leading on all fronts. 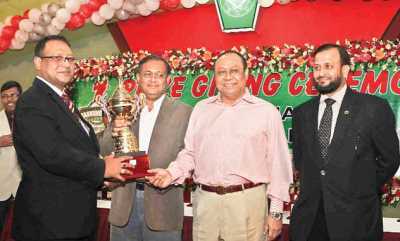 Hasan Mahmud also thanked Bashundhara Group Chairman Ahmed Akbar Sobhan for sponsoring the high-voltage tournament. He termed Bashundhara City Shopping Mall a unique multi-storey shopping complex along with its recreation centre. The GOC also said a modern gymnasium and swimming pool are going to be added to the Savar Cantonment with the generous help of Bashundhara Group. Through this tournament, many talented players were able to flourish their latent talent. As many as 203 players were participated in the event, he mentioned. Brig-Gen Abedin said Bashundhara Group has taken a landmark step in resolving the housing problem in the country. Bashundhara Group Chairman Ahmed Akbar Sobhan, Mahbub Morshed Hasan, chief adviser to Chairman Bashundhara Group, Mustafizur Rahman, DMD, Brig-Gen (retd) Ahmed Muktadir Arif, senior executive director (AHR), Moinul Hossain Chowdhury, publisher of three newspapers of East West media Group, Ashraf Hossain Mondal, head of audit division, and Md Saiful Islam Helaly, chief marketing officer (cement), were also present at the programme. A one-minute silence was observed to commemorate hundreds of deaths of the Rana Plaza tragedy victims at the start of the event. The awards ceremony was followed by a cultural programme and a raffle draw. Bashundhara Group will sponsor the tournament next year as well.